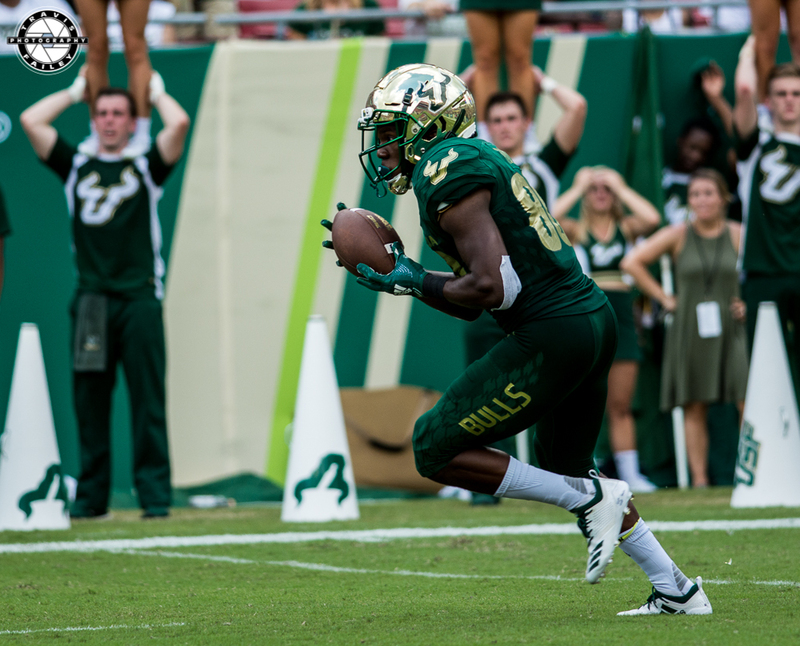 Tampa, Fla.–For the second straight week USF headed into a game favored by multiple scores and for the second straight week disappointed. While USF was able to squeak out the 20-13 win, you’ll be hard-pressed to find anyone short of Connor Akeman at the Daily Stampede who predicted the Bulls to struggle this much tonight, let alone this much against both ECU and Illinois. To be fair, and that’s the last time I’ll say that, there were a plethora of injuries for USF coming into tonight. It was uncovered today that freshman sensation Terrance Horne Jr. tore his ACL at practice this week. The second through fourth spots on the running back depth chart were all injured as Elijah Mack, Duran Bell and Trevon Sands were all held out. Mitch Wilcox left the game with an ankle injury. Tyre McCants displayed a limp before the game. He played through it, but with a line of just three receptions for 12 yards, he was far from a star tonight. Luckily for the Bulls, Strong mentioned after the game that Wilcox, Sands, Mack and Bell should all be fine moving forward. In addition, the Bulls have a bye week next week to help get healthy and the fact that McCants was able to play through whatever was hobbling him is a good sign. Other than that? The game itself was ugly. Blake Barnett completed just 12 of his 20 attempts for a lowly 181 yards and one touchdown, but he also punched one in on the ground in the first quarter. With the exception of Cronkrite’s 80-yard, go-ahead scamper in the fourth quarter, the backfield of Cronkrite and freshman Johnny Ford combined for just 62 yards on their other 19 carries. If there is a silver lining to the Bulls’ recent showings, it’s that the defense continues their streak of showing up when it matters and Darnell Salomon continues catching touchdowns. This was the USF defense’s second consecutive game without conceding a fourth quarter point, and that’s after a game-saving forced fumble from Bentlee Sanders and the defense giving up just seven points in the fourth against Georgia Tech. ECU struck first as ECU’s rushing QB Holton Ahlers dove in from the three-yard line and punched in a touchdown to cap off the Pirate’s 82-yard opening drive. USF would respond with a three-and-out and give ECU the ball back with the first of their nine total punts on the evening. 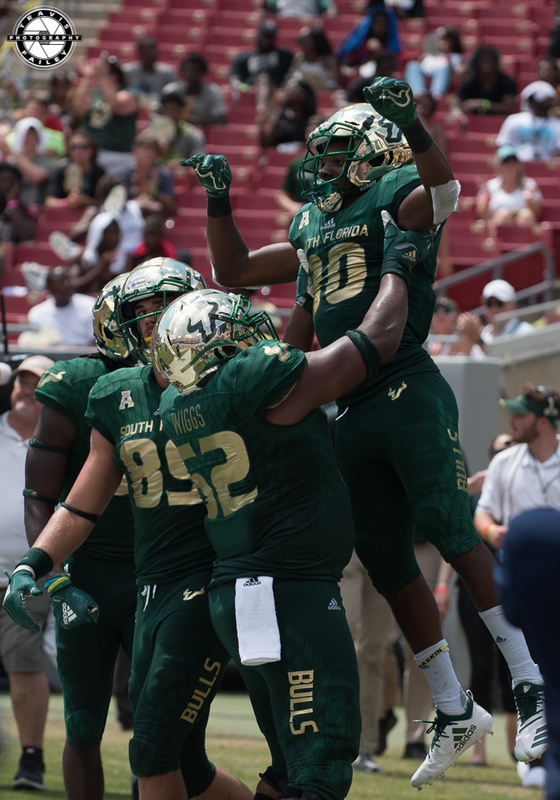 USF eventually found the end zone later in the first quarter when the Bulls were knocking at the two-yard line and Barnett kept the read option – something he’s found a lot of goal-line success with early in the season – and rolled out to the left for six. As we’ve unfortunately become accustomed to, Coby Weiss’ extra point was blocked and the Bulls trailed by one. The rest of the quarter remained scoreless, but just seconds into the second quarter Barnett found a wide open Salomon down the sideline and struck for a 66-yard score, giving USF the 13-7 lead. 14 minutes of stalled drives and field-flipping punts later, ECU was able to drive down the field and give K Jake Verity a field goal opportunity as the half expired, cutting the lead to just three as USF held onto a 13-10 advantage. USF began the half with a golden opportunity to pull two scores ahead, but a quick fumble from Deangelo Antoine left ECU with a short field to go, and they were able to put up another three points and tie it up at 13-13. The score would stay the same into the fourth quarter when, on 2nd and 8 from the USF 20-yard line, Cronkrite would find a hole on a run between the tackles and take off for the play of the game, an 80-yard burst that would put USF ahead 20-13 with 10:13 remaining. Fields would flip a couple more times until ECU made their final defensive stand, burning all three timeouts and forcing a USF three-and-out. Following the punt, squeezing out one final chance to move down the field, ECU took over at their own 23-yard line with 2:05 left, but ECU quarterback Reid Herring’s decision making would cost the Pirates as his first pass of the drive was jumped and picked by USF CB Nick Roberts. USF would then run out the clock and take the ugly, sloppy victory. But hey, an ugly win is always better than a beautiful loss.